Handy, short for ‘handyman’ repeats a similar image of a friendly, waving alien creature throughout his Seoul graffiti. He deals in bright colors and his cheerful alien counterpart can often be seen waving ‘annyeong’, or ‘hello’ in Korean, to passers-by. He hopes his work is a calming influence on people suffering with the stress of modern life in the city. I like his work because it is colourful and it connects with me, looking at the graffiti makes me more cheerful and optimistic which meant his artwork worked. 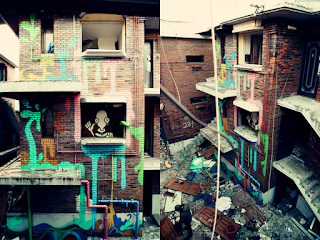 I personally also like urban art so his graffiti appealed to me more.